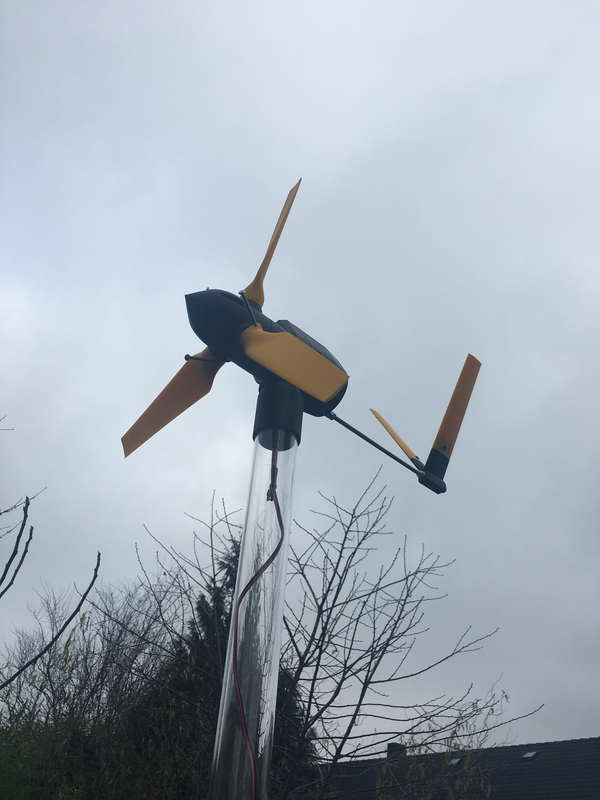 MKII 5 Watt 3d printable Wind Turbine with passive variable pitch mechanism. All Printable parts can be printed without the use of supports minimising post processing. Please see MKI for printed part pictures and assembly animations. The MkII has three design improvements, the first is an all important tail fin to allow the turbine to turn into the wind and extract the maximum wind energy in changeable conditions, the second is a stiffer tower structure with bigger bearings and increased diameter locating pin to support the increased loads from the tail whilst allowing for the third improvement which is the inclusion of Split Ring Electronics. The Split Ring Electronics allows the turbine to spin around the tower axis without any limitations it brings the power electronics into the tower where there is more space and its easier to access. 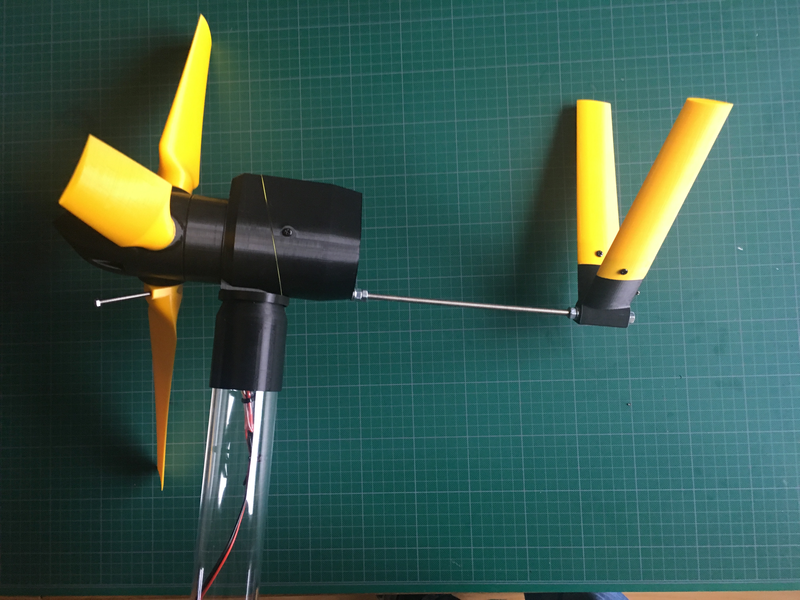 This fully functional wind turbine has been specifically design to be manufactured, assembled and operated at home with its unique 3d printable design. 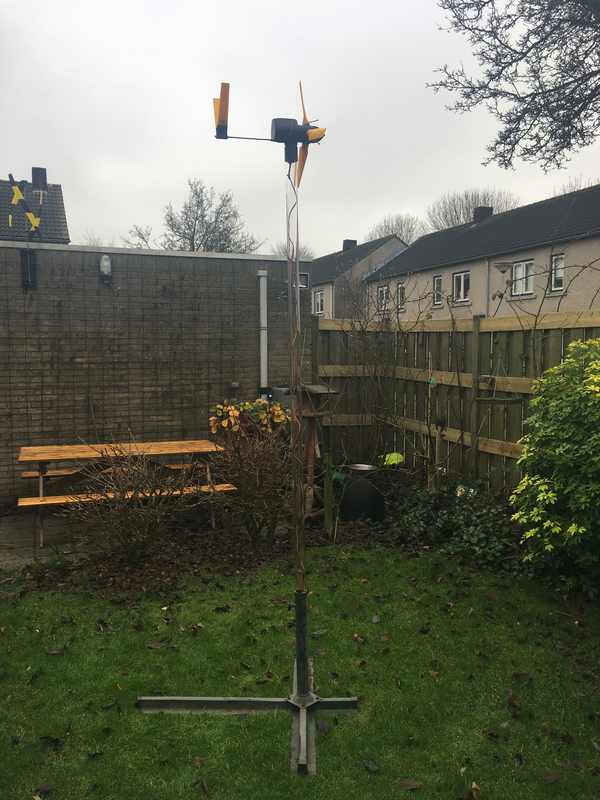 The wind turbine is optimized to produce a power output of 5 Watt (12volt ~0.4amps) at 5m/s wind speeds, perfect for battery charging applications. Thank you for your work on this project which contains a great deal of work. I am aiming to produce this as my first "big print" and am sourcing the non printed components here in the UK. I have managed to get the majority but am having real trouble with the slip ring. The component link in the downloaded document is "not found"
Does anyone have any additional information on how to connect this and the stepper to create the generation circuit for a complete newbie to electrical/ electronic wiring please. Daniel - thanks for design - good engineering approach here. Confused - can't print blades vertically - less cleaning up afterwards but too high for my home-made 3DP - where are the 2-part STLs please? Also confused with MkII, MkIII and files labelled "Version 1" - could you do a clerical clean-up please? I hate to waste filament. Abraham Pineda - No it would require a redesign of a lot of parts. 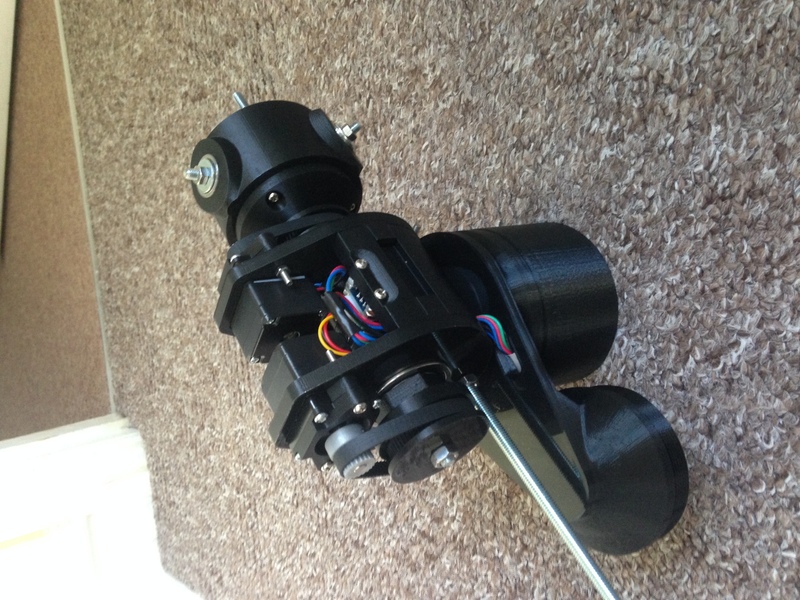 If its more power you are after i'm designing a much more powerful turbine using an NEMA23 Stepper. Would be possible to customize it in order to use nema 17 or any other normal sized stepper? @Bikemadevs Hello, using the settings in the instruction manual it will take 103meters or approx 811grams. The structure uses the most plastic in a single print at 16.2meters 50% infill. Excellent work Daniel, any ideas how much filament will be needed? saw a post of you three months ago looking for the split blade. 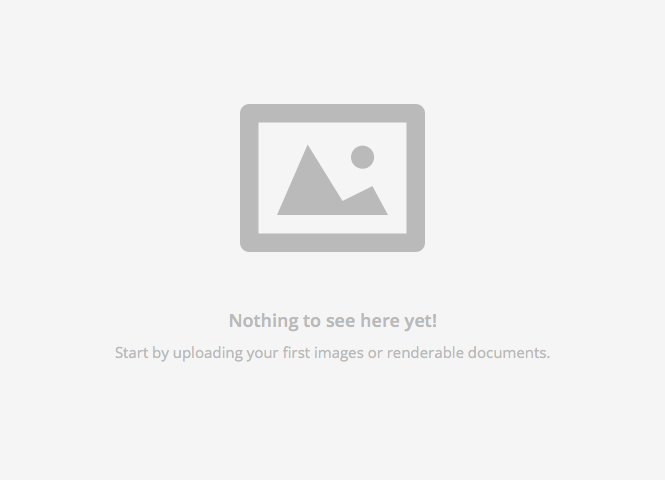 I think you are looking for this link? Guys, did any of you download Greg Whitmore's split blade before it was taken down? I have another user who's printer isn't big enough to print in 1 shot? Would really appreciate the files if anyone has them? All, i've added a cable guard into the 'Thing files' with an explanation picture with the other pictures. Simple push fit ring to protect the slipring and stepper cables from the main shaft. I forgot to give you an update on my "nuts-case" ;-) after scaling the blades by .2% as you suggested the m5 nuts just fit into the blades. Thanks for the tip. @ Michael, that would be great a lot of people have been asking for an NEMA 17 sized turbine. I'm thinking about designing and developing a custom axial (No cogs, no direct contact) generator for the MKIII. I'm measuring the performance of the current turbine to get a reliable baseline to compare against. any thoughts on experimenting with an Archimedes's screw type of blade design? should yield more torque than props. I'm tinkering with the MKII STL's and fitting a NEMA 17 type to the housing. If all goes well, I may send a copy of the remix to you? I have a tray of NEMA 17 unipolar (6-wire) steppers i bought from ebay some time ago, any way I can get a copy of the SLDPRT's for the main housing and rear housing so I can scale the housing to a NEMA 17 40mm x 50mm Long stepper? Is this easy to modify for a NEMA 17 (or two)? I want your feedback, if I was to develop a MkIII wind turbine what changes would you want to see? The 75 tooth pulley was a little bit to tight and was causing to much friction. could you check the dimensions of the M5 nuts you planned for inside the blades? Maybe the bunch you got simply have slightly different dimensions than the one I get here in Germany (should not be but hey ...) When I measure them they are between 7.9mm and 7.92mm wide. Sounds good greg not used that material before but will look into it. I too use the gears on mine, I found a small wrap of PTFE tape on the Stepper shaft takes out any concentricity issue when you tighten down the grub screw. Hi Sepio, my original design intent was 3:1 and this was easily achieved with the belts but the cogs just take up to much room and 2:1 was the best I can do in the space I had. I'd test the highest ratio possible, the higher ratio may mean you can run the turbine slower by trimming the PVP (adding more weights) and maintain Power output. Interested to know how you get on! Biggest problem I had with the pulleys was printing the sharp edges on the teeth profile, I spent an age on it and in the end opted for the cogs. I have received the GT2 timing belts and pulleys. And I'am going to print some different sized main shaft pulleys to test the best pulley and belt combination. You said "The top pulley is 20 teeth, the bottom is 60 teeth and the belt is 158. This will maintain the 3:1 gear ratio." But if check the gears they have 48 and 24 teeth. This is a 2:1 gear ratio. What is the correct ratio? 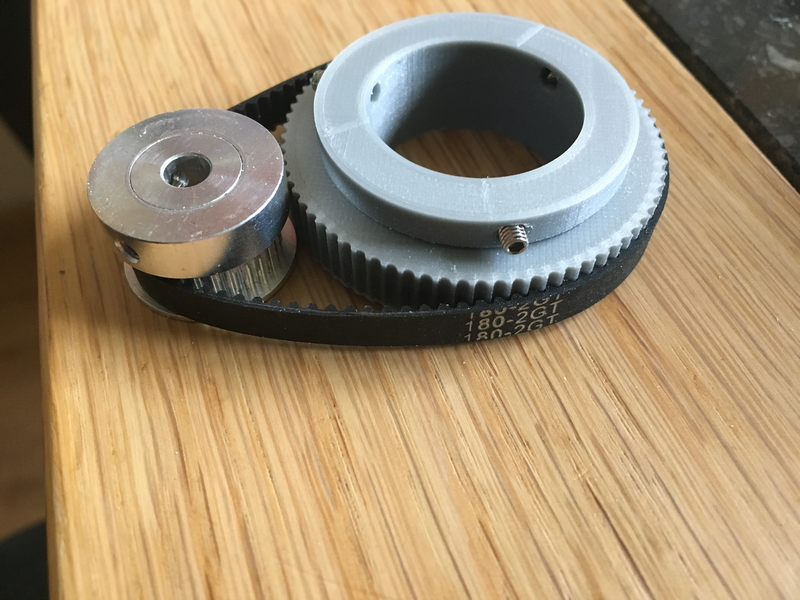 I have 4 different aluminum top pulleys with 16, 20, 28 and 40 teeth for the stepper motor shaft and I want to stay as close as possible to the optimal gear ratio. @Greg, I wonder if it was an issue with timing, did you try and install the nut the instant the print head moved away from the part? I was stood next to mine nut in hand and had it installed and printing again in 5 seconds flat :) just thought it might have cooled and shrank a little? Really good to hear your getting good feedback! Guys, the turbine was design for the fits and gaps of PLA shrinkage and not ABS, i've printed 11 blades throughout the process without any issue with the nut. If you let me know what size across flats you need for ABS shrinkage (haven't printed with ABS yet..) I can adjust the solid model and provide a STL model specifically for ABS? @Greg - I second your problems with the m5 nuts. They holes for the nuts with my prints (ABS, .4 nozzle) came out 7.6mm while m5 is defined with 8mm sides. Do your steel pins hold the torq of the rotating blades? Have you glued them in some way? Here are some pictures of the Slip ring install. All, find link to optional Pulley and Belt drive for reduced noise! I've included the solid works models so you can modify to improve the fit if required. Here is the MkII with GT2 Belt driven parts in place. The top pulley is 20 teeth, the bottom is 60 teeth and the belt is 158. This will maintain the 3:1 gear ratio. @Dan, did you also test longer rotor blades? Does this result in better power output in lower wind speed conditions? Or does this also change the way the PVP works? What where the number of teeth on your pulleys and what was the belt length? PS if your wondering what the hell is in the picture :)) its an Active Variable Pitch (AVP) variant that uses a raspberry Pi Zero to measure the shaft speed and then uses an NEMA11 to actively control the pitch of the blades to a given formula I wrote. With the Pi I was able to remote log in to the turbine to monitor its performance and also tweak any settings on the fly. Effectively this was the test machine that lead to the PVP design shared here. @AKuechler. Seems like you solved your issue but for others... I added a file called easy print tail, I split the tail into 3 easy to print pieces you should defently try that and use a high brim number on the aerofoil sections. To reduce the gear noise I have ordered some GT2 pulleys for the nema shaft and timing belts. I have already printed a large pulley for the rotor shaft. If I know which combination of nema pulleys , belt length and shaft pulleys works then I will share the information. I have also removed the voltage regulator from the electrical part inside the nacelle. I am going to put a step up down (boost buck) convertor on the bottom of the pole. I would like to get an output voltage of 5 volt so I will be able to charge an external battery pack. I bundled 3 wires for the positive side and 3 for the negative side. I tested it with a bench power supply and a 1.5 amp test load. This included 3 meter of speaker wire which goes through the pole. tx for the great design. Which brand of nema 11 you are using? I found JK28HS51-0674 but the length is specified with 51mm and this would obviously not fit the casing. @Greg - you made my day. I had a bunch of failed prints with this tail fin and the one that finally worked is ways off the quality possible with your design. Thanks very much! I put mine up yesterday (UK in being battered by a storm) I thought it would be a good test of the safety mechanism in the PVP, unfortunately I didn't secure the pole enough and it fell over and broke two of the blades :( gutted. @ Roman Dan, Hello the turbines design output is 12volt x 0.4 amp is approx 5Watt. @ Sepio the Turbine with modifications looks mint good job and I really like the clear pole. I've moved into my new house now and can get back to outdoor testing! 12V at 4 amps doesn't make 48W? There is a folder "Fusion 360 Custom Parts" with the parts I designed. The Fusion 360 export files are inside the zips. The MKII with my custom tower header for a 50mm pipe. My build is finished. Now I have to wait for a windy day. I used a 50mm pipe and designed some custom parts. I also created a bearing cover to prevent the electronics inside the structure assembly from touching the shaft nut. you can just press fit this over the bearing. The Nema 11 Cog was to big. I printed this a 95% and used a 5mm drill to make the hole a litte bit bigger. Now both cogs are turning without to much friction. Hello Joanne, Item 7 the blade x3 includes the nuts (their not called out separately, the nut is also called out on the blade drawing. M4 nuts/bolts won't work without modification to Rotor Assy Item2 the part needs to be an interference fit with Item 13. Hmmm on the list of parts for the Rotor Assy it lists 3 M5 40mm bolts, but only 1 M5 nut. I put M4 nuts in my blades.... looks like I'm gonna have to get me some M4 40mm bolts!! I printed al parts. I have to wait for the bearings before I can start the final assembly. Below a link to the photo's of the all the parts. All parts did print perfectly. I only need to change the tower header. I my country (the Netherlands) I can't find a pipe with the same inside diameter. I bought a pipe with 70mm outside and 67mm inside diameter (1.5mm wall thicknesses). The Tower Assembly Item 7-O-ring seal can be replaced by printed 'Tower Setting spacer'. Thank you for the direct links, I have ordered the parts now. I will try to start printing the first parts soon. Thank you for the new tail design. I am going to print it in a few days. I just started the tower shaft print. I've uploaded a set of STL files called 'Easy Print Tail Fin' i've split the tail fin into three parts and made the base bigger for better bed adhesion. With the easy print tail you are more likely to get a successful print first time. Note I strongly recommend a 30-Brim with the two aerofoil sections for best results. Fixings are M4 Self tapping screws however the push fit should be tight enough on its own or with a little glue. You could get your students to design their own blades for the turbine and see if they can improve the performance relative to my design. You could back to back test the turbine in controlled conditions using a Fan and measure the power output of the different designs to see which is best. I created an aero spreadsheet that allowed me to alter key parameters of the blade, NACA spec Chord/Thickness/Chamber etc and import into solidworks to be tested in flow works. Just thinking out loud, depends the age group you work with I guess? Ahhh the grub screw was on the MkI BoM list but not the MkII BoM list, odd but its an M3 Grub. Worth Nothing that Rotor Item 14 and Wind Turbine Assembly Item 6 are actual M4 Self Tapping screws not M3 as pointed out by Sepio. Great design, and very educational! Planning to print this to use in my class, but I have some questions. There are some errors with the link provided for the bearings. Is it correct that both type of bearings should have a flange? Also, can you provide information on the tower location bearings? You mention three types of different bearings in the BOM but only two of them are specified in details. & Seal size and dimensions? The STL imports into Cura a little odd however if you rotate the tail on the green axis/orbit by 120 degrees it will sit on the base with no overhangs (maximum unsupported angle is 30 degrees). When the tail is on the build plate it should be in the same orientation as on the installed turbine, I.e as a 'V' with the V spanning from corner to corner of the build plate. I've never had an issue with bed adhesion to be honest even with the smallest of bases, perhaps a Brim with a large number of lines might help? Could even use a raft or design in some custom supports? You are very fast. Thank you for the new designs. How did you print the tail. There is no flat part. I managed to tilt it 1 degree but there is always a place on the model that is not supported. I can use support but with the small contact area I don't think it wil stick to the build plate.